In the future, the sun is dying and Earth lives another glacial period. 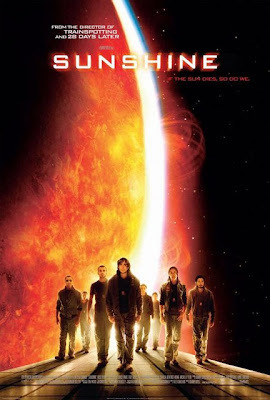 After the failure of the Icarus Mission, a team of eight astronauts are sent to the sun in the Icarus II Mission to explode a weapon generating a supernova within the sun in the last hope of planet Earth. However, when a crew-member commits a mistake in the operation of the aircraft shield, he jeopardizes the survival of the group. Sunshine is more than the average sci-fi fare, and has a lot more to it than the others which seem to over react to the event of the end of the world. First thing: the sun is dying. Scientists are actually thinking that this may happen. Sure, some think 2012 is going to happen, but after that movie, I don't think I can even believe in that theory. With this one, it doesn't really show the effects of the sun not shining on Earth, but instead follows the story of the crew who are trying to save humanity by reigniting the sun. Which brings me to the second thing: it has a relitavely unknown cast (well, not in film world, but I doubt many of the normal people would know who half of the cast is), and we can believe in them. Have you noticed how all these other apocalyptic tales are headlined by people who are famous for being famous (cough, Will Smith)? They always look like they are either in it so the makers can get some money or the actors want the money themselves. However, with Sunshine, the hero of the story is really Capa, who is played by Cillian Murphy. I'm not being bias, but he is the hero I have been searching for. Sure, at the start he's one of those people who are too smart for their own good and is a bit arrogant because of it, but in the end I was feeling like our future was in his hands and I had full confidence in him. And for once, he was a believable hero. One of the coolest things about Sunshine was the awesome cinematography and the way Danny Boyle could capture emotions on camera. Because of the way this was made, I was scared out of my boots about what would happen next...it had such an intense feeling of loneliness because they were in space with no real contact from Earth, and I felt a part of it. The way it twists and turns was simply amazing, making it a specific must-see sci-fi. Terrifying sci-fi that captures emotion and our future in a way that is too rarely used...truly unique. Not to mention the stunning performance from Cillian Murphy.